I'm afraid Belgium – and roads/cycle tracks/pleasure-at-being-in – isn't getting any better. The rain doesn't help. The view above is of beautiful, tourist-magnet Gent this afternoon and the charming square in front of the cathedral here. 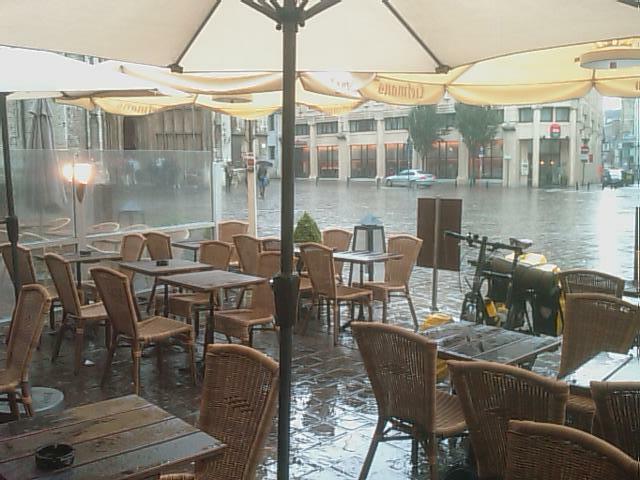 Drenched, and as seen from a café to which I have repaired for some waffles en route from Brussels to Bruges. At least the food here is delicious – as was Tamas's Hungarian goulash last night and palatsinta pancakes shared with his partner Moni and with Oana, who did gratifyingly manage to tear herself away from the aftermath of that Irish No-vote. Marvellous to see them, and to be immersed again briefly in the minutiae of Euro-politics as seen from Brussels. But Saturday also provided – for the moment un-illustrated – food for thought about Belgium's, Europe's, Britain's and indeed my own family's colonial past. My middle name is Lugard, as is that of my father, his father, and of our own eldest son Christopher. The name is that of my great-great-uncle Lord Lugard, one of Queen Victoria's most energetic and successful colonists in the late 19th century. Lugard secured Uganda for the British empire, founded the united state of Nigeria as its first governor, was then a very successful governor of Hong Kong, and is credited with inventing Britain's then very effective system of colonial rule through local potentates. He was also – something that's maybe in the Lugard genes – a hopeless romantic, falling entirely inappropriately in love with a married woman while a junior colonial officer in India, and then getting himself a military posting to East Africa in the hope, essentially, of being killed and thus ending the misery of his rejected love. In failing to get himself shot, Lugard acquired for Queen Vic a large chunk of Africa, and his biography makes gripping reading – as good in parts as the Flashman novels, except that this bounder was real, and actually from all evidence a very thoughtful, decent man. And, of course, a product of his colonial times. Times when European states squabbled very unattractively in the grab for Africa, laying the foundations while they were at it for the First, and therefore also the Second, World Wars which devastated Europe itself. Belgium’s part in that story is particularly unpleasant. King Leopold’s personal grab included great swathes of what’s now the Congo, and saw this country plundering Central Africa for rubber and resources, and, with the imposition of inappropriate administrative models, in turn setting the stage for the chaos and bloodshed, and genocide too, that have continued in bursts since independence in the late 1950s. But thinking of Lugard, as I did while visiting King Leopold’s extraordinary Africa museum just outside Brussels, where IS the line between benevolent intervention and the abuse and exploitation of which the museum now, rather belatedly, acknowledges Belgium to have been guilty? The Belgian legacy in Africa is now viewed, within Africa and outside it, as very negative. Yet Lugard is still, largely, revered in Nigeria. Was British colonialism better than that of other nations? If so, how? Discuss. With both my parents born in British India to colonial civil servants and with Lord Lugard perched prominently in the family tree, ours is a family with British/English history, as well, perhaps, as hopeless romance, imprinted in its genes. World wars, colonialism, fascism, communism. Some sins acknowledged, some still denied and repressed. Some nations ready to face the past and accept responsibility where it is due. Others still finding that hard to do. A complex and rich continent. With much more history still to be made. The rain’s stopped. Time to move on.